We are doing an impromptu camping trip for one night in the San Gabriel mountains. 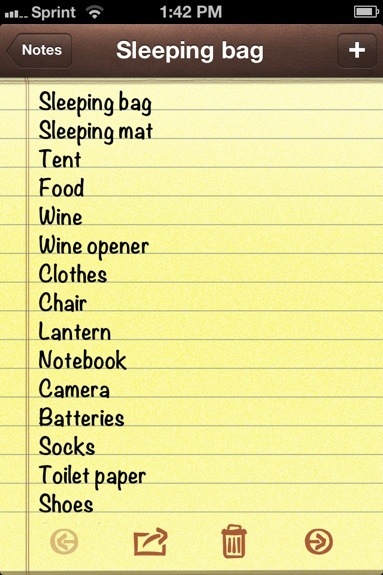 One thing that helps me pack is my list- all the essentials! Then I don’t have to think “Did I pack that?” As we are driving down the road. What’s on your list? Ohh!! I’ll have to check that out! Thanks! Haha, never forget the wine! I love the way it’s more important than a torch, batteries or even shoes! Thanks! You have to set your priorities straight! HAHA! For sure! I try to keep one in my bag at all times for that very reason! Two comments; 1. Wine is below food? 2. Toilet paper is below socks and camera? What the heck? Prioritize, prioritize, priotize! Nice! Camping is my new obsession and I am stalking Craigslist for good deals on gear! ^Kate – I am going to check out that app! Awesome! You should also join a program like REI- you get 10% back every year on all your purchases. Its nice because your forking out the money any way and you get rewarded and you can use your 10% back for upgrade purchases! Those are my favorite! Love taking wine on a backpacking/camping trip! BEST! True story, I always remember the adult beverages and forget the lantern/headlamp on last minute trips. Perhaps your list is just what is needed! If you talk to my lady friend, you need at least a week’s worth of clothing and a cello. Never know when you might wind up ballroom dancing on top of a mountain somewhere.